The Matrix is, in my opinion, tied for best movie of all time with 2001: A Space Odyssey. Here's the story: Jon Sullivan, Michael Kindig, and I went to see a late showing of this film the day it opened. Throughout the entire screening, Jon and I would look at each other with amazement, like 'how did they do that?!' kind of faces. When the movie ended, Jon and I were chatterboxes, with talk of going to see it again. At the time, I said aloud that it was possibly the best movie of all time, but Michael disagreed. He didn't see through the 'action' part of the movie to the 'vision' part. He's come arround though, talking with Mike recently, he said it is definitely one of his favorites now. 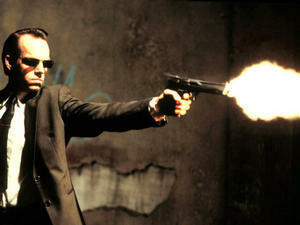 Right now, the sequels 'Matrix Reloaded', and #3 are being filmed, to be released in 2003 and 2004. I am going to wet myself when that happens. or may not delete the old 'Movies' article. Michael (2002-05-08): You're right. I wasn't impressed the first time I saw "The Matrix." I had seen that type of still camera work in other works. Two things changed my initial impression: 1) when I saw a "behind the scenes" piece on television that explained the "comic book" views and 2) when I read about how many stories were finely woven into the plot and all of the respective references. There are many layers to this movie and I was wrong to express my viewpoint so hastily. Sheesh, all this talk of The Matrix, I want to see it again. JM B (2002-05-29): Erik. You are right on about your entire review of Insomnia. Couldn't agree more about both Robin Williams and Al Pacino. He was a bit out of character and much cooler though in Scent of a Woman. Did you see Unfaithful? Also very good. Haven't seen Attack of the Clones yet have you? I know it's not "serious sci fi" but Star Wars is still great. Marie (2004-03-26): I say that the star wars movies are just as well as The Matrix, but the matrix is it the best movie ever. I Know Idea how my dad hates it.He says that its just a lot of bull S###. I told him that it not that it is a movie with lots of action! I love it! I bet the next matrix is going to be as well as the last 2 ones.I hope any ways. hot & Sexxxxxxxxxxxxxxxy! don`t Ya`ll think???????????????? Mara:"You who go where no-one else will dare. Will you be my god?" Siddhartha"Architect. Finally I have met you. You will not rebuild your house again." Mara:"But I am your house and you live in me." Siddhartha:"Oh lord of my own ego, you are pure illusion, you do not exist. The earth is my witness." The literary quotation can be found here and a discussion about the parallel in The Matrix can be found here. Marie (2004-04-22): Oh! sorry I ment MR.REEVES!!!!!!!!!!!!!!!! 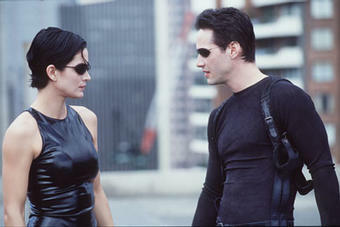 I`ve seen little B-what ever I think that yall are all crazy talking about a different movie when were sopost to be talking about THE MATRIX!!!!!! DUH!! !